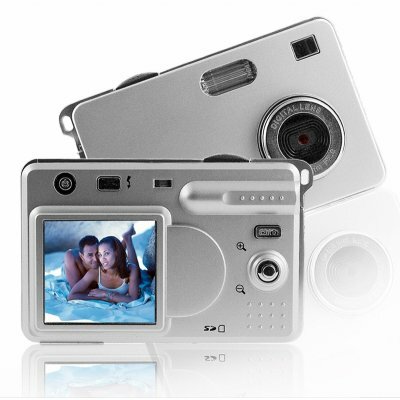 Successfully Added Digital Camera, 5.5M Pixel, 1.5 inch Color Ltps LCD to your Shopping Cart. Digital Camera 5.5M Pixel - 1.5 inch Color LTPS LCD Compact and affordable 3 mega pixel digital camera (with up to 5.5 mega pixel resolution via interpolation) and with a high color 1.5 inch LTPS LCD display. Other great features for this easy to use and attractive digital camera are 3 mode operation (still pictures, digital movie clips, web camera), an SD/MMC slot for up to 2GB of photo storage. This is a perfect camera not only for beginner photographers, but as a high profit import item direct from China, and with no MOQ, order as many or as few as you need. Note on Interpolation: Please note that this camera takes images in sizes equivalent to 5.5 megapixels. This is through a software resizing process on the camera called interpolation. The image sensor of this camera has a native resolution of 3.0.